This fall marked Surgical Volunteer International’s (SVI’s) 3rd trip to Mansoura, Egypt to provide top-notch cleft/palate care and laparoscopic procedures to children i n need. Our ability to provide this comprehensive care, was made possible through a unique and special model of collaboration with the Mansoura University Hospital. When the all-female SVI team arrived, we got right to work. In one day, with the support of local staff, we identified, screened and supported over 75 children and families who traveled from all over the greater Mansoura region with the hope of greater access to health care and a better future. From the screening, 40 children were added to the surgical schedule with a completion of 34 surgical cases at the end of 5 days. Each day our two female SVI surgeons, 3 female OR nurses, 3 female anesthesia providers and our pediatric Nurse Practitioner (female) worked side by side with the local hospital staff to complete a variety of cases. 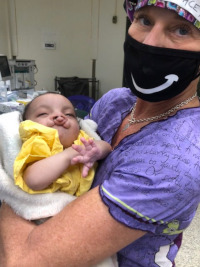 22 cleft lip and palate procedures along with 12 laparoscopic surgeries such as appendectomies, choledochal cysts and complex colon surgeries were completed in 2 OR rooms during the 5 days of surgery. Our incredible partners were the secret to the success of our mission. SVI surgeons and nurses also collaborated with Mansoura hospital medical employees to support children after surgery and help families prepare for discharge. In-services were held by the SVI surgeons to educate our fellow surgeons, residents and medical students alike. And suddenly, five days of life-changing surgeries and care concluded, and we were finished. With tears in our eyes, joy in our hearts and new friends in our contact list we hugged our extended Egyptian medical family farewell and travelled back to our respective homes in the USA. I will be forever grateful to the people of Mansoura for entrusting us with their most valuable possession, their children, in hopes that we could provide the care that they might not otherwise obtain. Heart-felt love to my fellow Egyptian co-workers for taking the time to share their culture and language with us. A deep sense of unity, gratitude and respect to my SVI team, an amazing group of women from four corners of the USA that met in unknown territory and bonded over a common goal of love for what we do and for communities less fortunate. Mansoura University Hospital and your team of exceptional doctors, nurses and medical students, you will always have a special place in my heart, until we meet again, Shakrun (‘thank you’ in Egyptian).